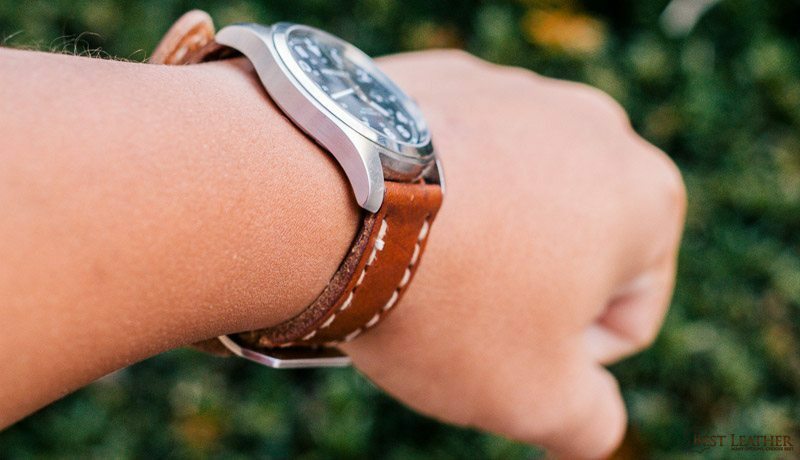 We’ve recently had the opportunity to team up as watch-wearing BestLeather writers to show you a few different offerings from Da Luca Straps. You may remember Da Luca from our review of one of their NATO straps a few years back. Da Luca is still hand-making high caliber watch straps, and today we’d like to show you the Pauscovitz, Brennan, and Blundtund. The Pauscovitz is a 22mm Swiss Army ammo pouch leather strap. I received this strap to be paired with my 42mm Apple Watch. The leather is incredibly thick and rugged! This might be a good thing, since the vintage leather may not last as long as freshly tanned leather. This strap should last for ages. The leather is skived significantly near the watch so it can fit around the pins. I love the marks and stitches that came from the ammo pouch, and was bummed when a couple of these stitches fell out after a few weeks. The stitching actually done by Da Luca is done well and has held strong. I had to clip off the ends of the thread, but I wondered if this was intentional to match the vintage style. Overall it looks fantastic, and I’ve received quite a few compliments. The buckle is very large, and matches the incredible thickness of the leather well. I thought it would press into my wrist, but it’s never once bothered me. Originally the strap’s width actually struggled to slide through the buckle, but over time the strap has worn in and things have become more smooth. While I did get a good fit right in the middle, I wish there was more sizing holes. The pricing on the Pauscovitz is definitely on the luxury end, which makes sense, as Da Luca originally made their straps for Panerai brand watches. In comparison, this strap would seem like a pittance, though it’s over half the cost of my Apple Watch! It is made quite well and looks fantastic. The vintage ammo pouch leather is somewhat rare, as well. If the look suits your fancy this sort of strap may be for you. 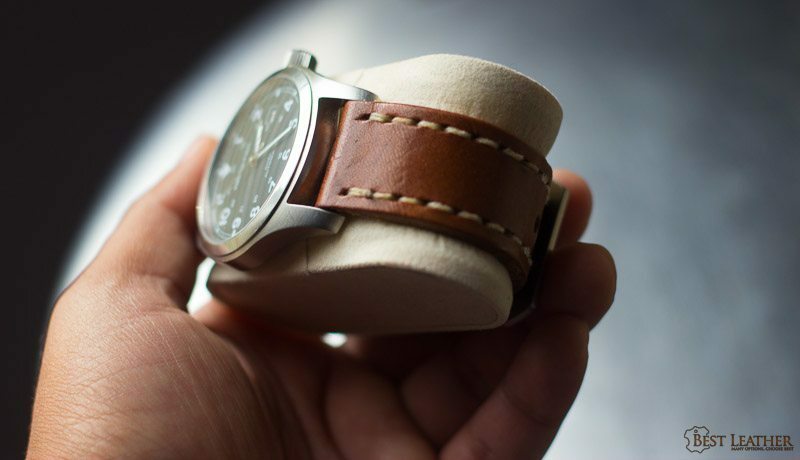 This watch strap from Da Luca is particularly adept at fitting in almost anywhere. Made of premium Horween color 8 shell cordovan means it’s built to last. It’s made of a single layer and unlined so the stitching is purely for aesthetics, but it looks great and stays lightweight. One nice touch, that I haven’t seen on many bands, is the edges of the band where it’s folded for the spring bars of the watch are skived to be a bit thinner. This gives the band a very uniform thickness. If there was fault to be had it’s that there is only the single floating keeper. I typically prefer two keepers, one stitched and stationary and the other floating. As with all luxury goods, value is arbitrary and I’m of the option that if it’s what you want it’s worth the price. 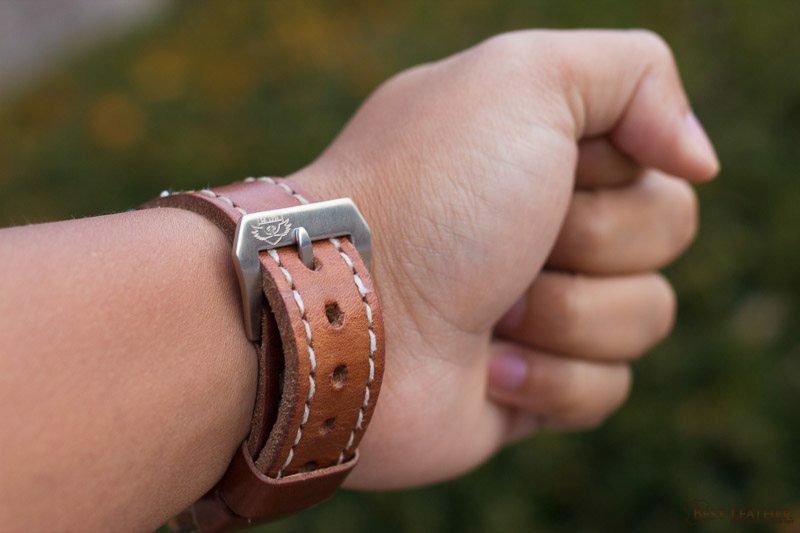 Da Luca has tons of designs and leathers to pick from so check them out and see if you can find the next accessory to go with the mechanical marvel on your wrist. The Blundtlund strap is one of the vintage straps Da Luca offers to accommodate watches with 22mm lug widths. It is made from Swiss Ammo Pouch leather with notable thickness. This is a much thicker strap than your typical two-piece leather strap. The specific color is a light caramel color that I presume will eventually patina to a darker brown color. It goes well with black or white dialed watches. Being that this is a full stitch strap and not particularly dressy, I’d say it makes a great strap for everyday and casual wear. 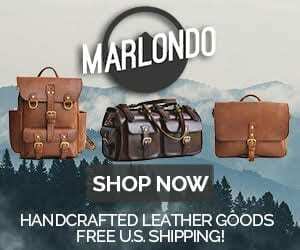 With that in mind, I suggest it pairs well with field watches such as the Hamilton Khaki models as well as big-faced watches such as Panerai and aviation-style watches. The buckle has a nice brushed finish with signed logo. The strap uses two keepers to secure the excess strap when wearing. I’ve got about 6.5 inch wrists, and usually used the second to smallest hole when sizing. For a watch with a larger lug to lug length, the middle hole served me well. The strap does come with spring bar tubes for certain panerai models, but unless your watch is made to handle spring bar tubes or has drilled lugs, I would avoid trying to use them. 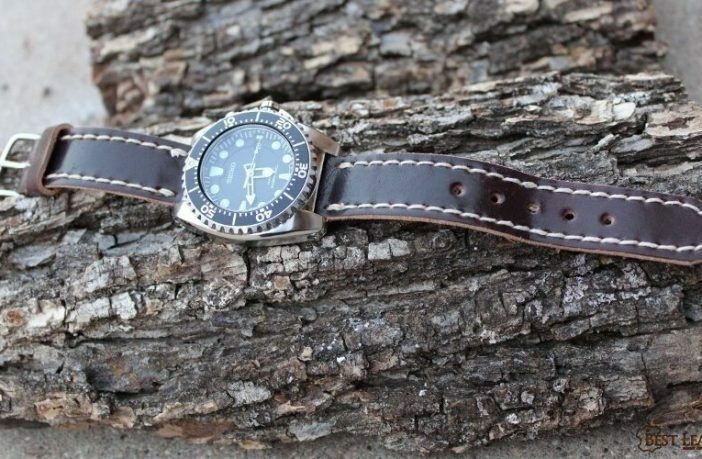 In contrast to other quality leather straps I own, I’d say this one is built tough enough to handle more than just fall-winter wear without fear of rapid degrading. The thickness of the strap is very solid, able to easily withstand cold winters as well as a little bit of sweat during the summer. Throughout my months of use, the strap holes have held up with no fear of expanding past expected limits. As with any leather strap, I’d suggest not swimming with it. As has been mentioned, value for luxury items like this is relative to the watches and owners it will be attached to. Quality straps can be had for less, but likely not on par with Da Luca’s buckle, full stitching, and somewhat rare leather. I honestly am impressed with the Da Luca Blundtlund strap. It has held up, its stunning, and seems like an excellent daily strap for me.